The problem is that most of the playing fields and parks kids play on today are treated with a chemical cocktail of herbicides, insecticides, and fungicides. Many of the commonly used chemicals are either likely or proven endocrine disruptors, which can interfere with the development of children’s immune, reproductive, and metabolic systems. Horrifying, right? We want our kids to benefit from playing outside, but at what cost? With more parents learning about these negative affects of non-organic field maintenance, parents are looking for change and for a better, healthier, and safer place for their kids to play. 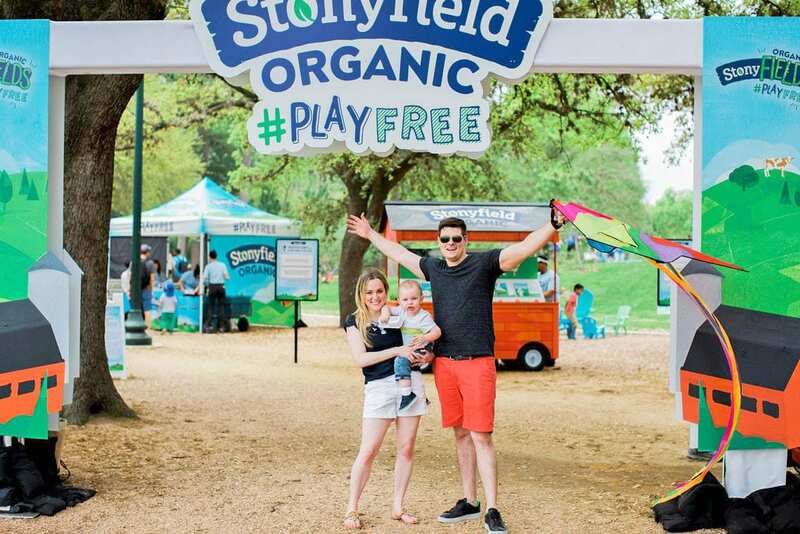 Stonyfield Organic — the organic yogurt brand that we all know and love — is taking on their biggest mission yet — to help to make all playing fields organic and free from harmful pesticides. Together with the support of experts and advocates like Beyond Pesticides, Non-Toxic Neighborhoods, and Osborne Organics, Stonyfield is helping communities and families across America to manage fields organically and free from the use of harmful pesticides. Enter: StonyFIELDS. Lucky for me, Stonyfield stopped here in Houston, Texas at Hermann Park! They along with The Hermann Park Conservancy and Non-Toxic Neighborhoods are working to transition the Molly Ann Smith Area and the Formal Lawn of the Centennial Gardens atHermann Park to organic lawn maintenance as part of their StonyFIELDS initiative in Houston, TX. If you are unfamiliar with Hermann Park, it’s massive. It’s a 445-acre park with rolling hills, trails, pools, and beautiful gardens, and hosts over six million visitors a year. Now that’s a big park! Each year the park hosts a Kite Festival and it was the perfect event to launch this new initiative! 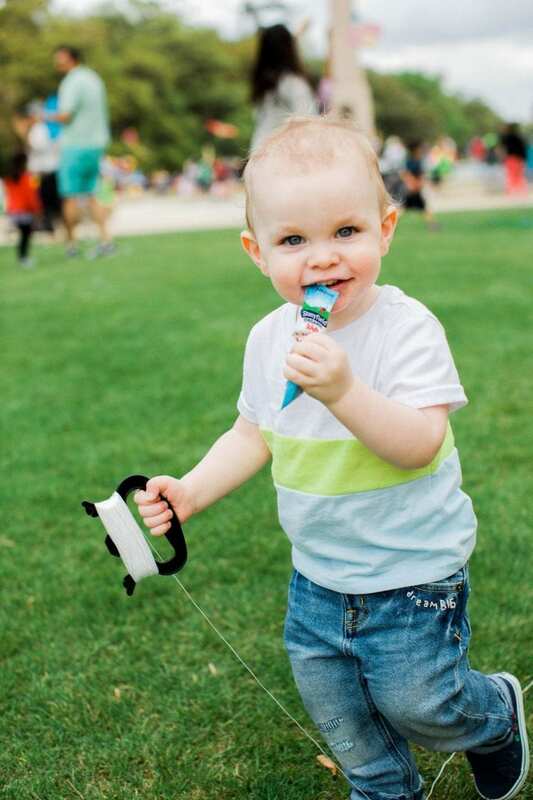 Transitioning the Formal Lawn and the Molly Ann Smith Area to organic management is a huge step for the city of Houston because Hermann Park is now the first park in Houston to use organic maintenance practices. Currently Houston does not have a policy in place for the pesticide-free transition of public parks, so everyone hopes that this project shows the city that if organic lawns and fields are attainable, they are possible in all of Houston’s public green spaces. Let’s go fly a kite! Up to the highest height! We were thrilled that our family got to attend this amazing event and support brands that we know and trust t0 celebrate a city that we love. There were so many great booths to check out at the Stonyfield section of the Kite Festival. They had a face painting booth, arts & crafts tables, games to play (like corn hole, connect four, cup stack), and delicious Stonyfield snacks and yogurt to try. 🙂 We had a blast! And a big shout out to Walmart who helped support the initiative by donating $20,000 and helping educate kids in schools! With many sustainability programs and policies, Walmart is proud to support the StonyFIELDs initiative! What an awesome way to get out of the house with the family and create some memories together while supporting a great cause. Stonyfield has already kicked off their initiative at several other parks! This Spring they may be coming to a park near you!